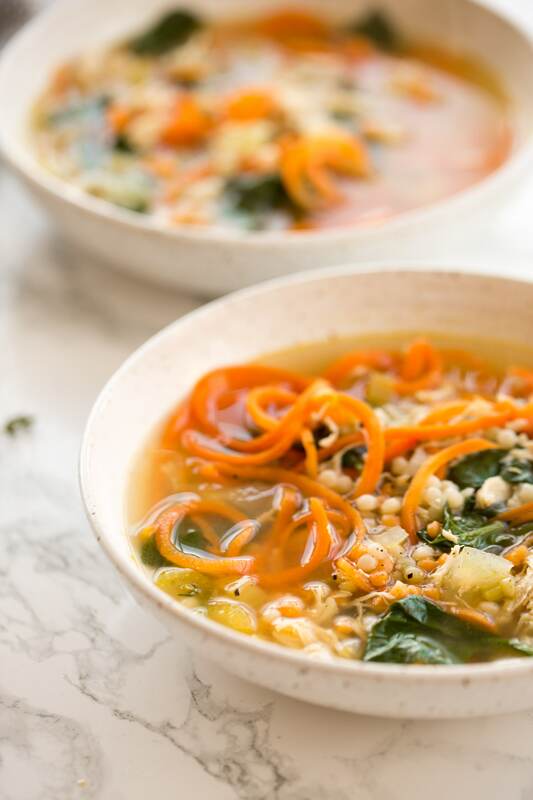 This easy chicken and vegetable couscous soup comes together quickly in one pot, for an easy weeknight meal that’s packed with protein and vegetables for the whole family. Spiralized carrots make this soup extra hearty, like a noodle soup! I’m always looking for one pot meals for those busy weeknights, when I don’t have much time for dinner and thus, don’t want to have a pile in the sink of dishes. 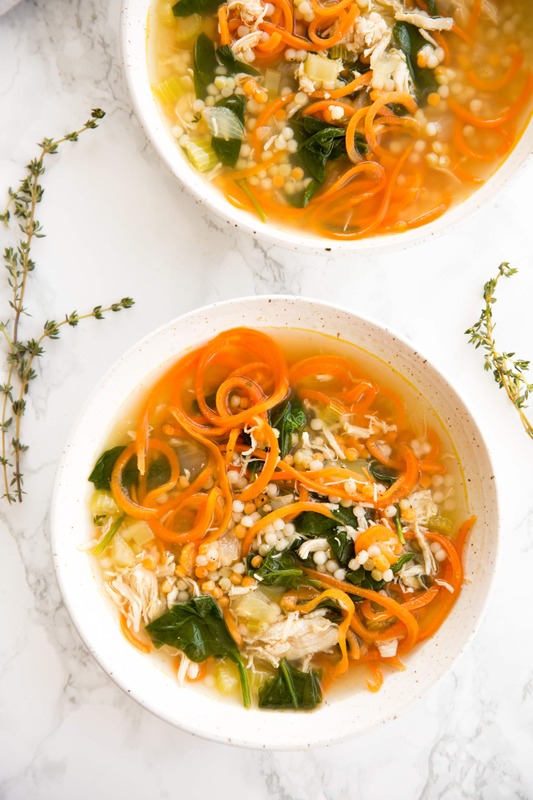 For this easy Chicken and Vegetable Couscous Soup, you’re getting a lean protein source from the chicken, plenty of vitamins and nutrients from the carrots and spinach, and lots of flavor from the sauteed onions, garlic and celery with thyme. 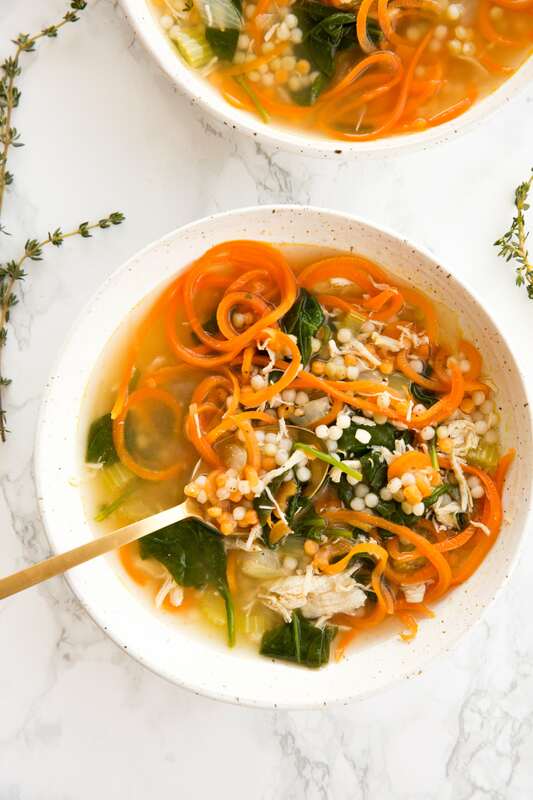 The spiralized carrots add a heartiness to this soup, almost like a noodle soup (without the noodles!) Plus, spiralized carrots look pretty in a soup and is a nice change up from the traditionally diced or cubed carrot in soups! Spiralizing carrots is quick and easy, especially if you have an Inspiralizer. Pearl couscous is actually a pasta, not a grain, and is a great way to add texture and consistency to a soup. It’s an Israeli pasta, developed in the 1950s apparently when rice was scarce!I love the Bob’s Red Mill brand, they make a tricolor pearl couscous that’s gorgeous! Bonus points! When I fed this to my 16 month old, he loved the couscous – especially attempting to pick up each couscous pearl with his fingers! How do you reheat soup? To reheat this soup, I recommend placing your desired portion in a pot over medium-high heat and bringing to a simmer until warmed through. For extra flavor, season with a pinch of salt and pepper. Cook the couscous according to the packaging directions. Once done, fork to fluff and recover to keep warm. Heat the oil in a large pot or Dutch oven over medium-low heat. Once oil is shimmering, add the garlic, onion, celery, season with salt and pepper and saute until softened, about 5 minutes, stirring occasionally. Add the thyme, stir for 30 seconds until fragrant, and then add the chicken broth and water and bring to a boil. Once boiling, reduce heat to medium and add the carrot noodles and chicken and let cook for 3 minutes or until the noodles are al dente. Stir in the spinach and couscous, season with salt and pepper, and let simmer for 2-3 minutes more or until spinach wilts. Why do you need to preheat the oven? Am I missing something?